Committing to getting fit and healthy can be a challenge. Sometimes the usual ways to get fit, such as joining a gym, aren’t something that fits in with a particular personality or lifestyle. Sometimes lack of motivation can become a factor or maybe the gym just isn’t appealing. Below are some ideas on how to get fit that don’t involve the usual activities. Both of these exercises will work to stabilize muscle groups. These exercises can be very addictive; skating for an hour at a time can burn upwards of three hundred to nine hundred calories. Put on the earphones decked out with a favorite playlist and get in the skating zone. These dances are full body workouts and are especially good for the brain. According to research, dancing is one of the only physical activities that can lower the risk of dementia, while giving a total body workout. Check out dance classes at the local rec center to give it a try. 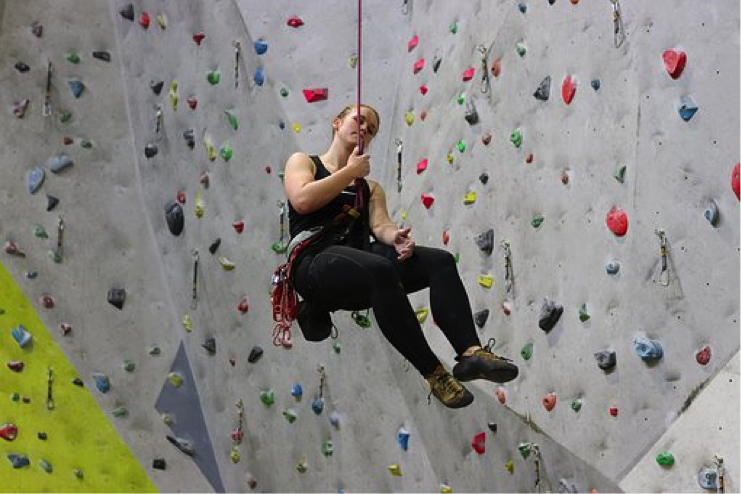 Rock climbing is classified as a cardio activity, much like swimming and biking. This is a great activity to get the blood flowing and the heart pumping. Look for local rec centers or climbing gyms that can facilitate learning the ins and outs of this activity. Breaking out the hula hoop is a great activity for toning and tightening the mid-section. In fact hula-hooping works thirty muscles in the body. The motion also improves the flexibility of the spine and can help to inhibit back injuries. This activity tends to be a seasonal one, but works great as a total body workout. It can improve balance while working many different muscle groups and torching calories. This is considered a low impact activity, making it less likely for you to get injured or do damage to things such as ligaments and tendons. This is a good exercise to use the power of the muscles to propel into the air and stay in control. Trampolines are fun and a great way to burn calories and build muscle mass. Many gyms now offer trapeze classes that cover basic skills such as getting in the air and flying with ease. Using a trapeze forces control of all muscles, because proper stretching and balance is needed. It is also a very good way to burn calories. Beginner classes are a great way to get started and move at a pace that is comfortable. Pole dancers need to be in impeccable shape, because swinging around a pole uses a variety of muscles and positions that require strength. Some find this to be a very enjoyable way to burn calories, build lean muscle, and slim the waist line. Ballet and Barre activities are great exercises for the backside and the legs, and they have a bonus of refining coordination and balance. Basic classes can be found at most gyms and teach simple movements to begin. This is a good exercise for the leg muscles and a toned backside. Indoor surfing classes can be found at many gyms, and this is a fun way to get in shape. The classes use short, mounted boards, a lot like surfboards, that tone the lower body. Archery can be a great exercise for the arms and core. Finding the right bow on sites like getrecurvebow.com is key. Find a good fit bow for you for this fun and unusual way to get into shape. Fencing is a great way to improve balance and build abdominal and leg muscles. Fencing can also go a long way to improving coordination and is a good cardiovascular workout because the body is constantly stopping and starting movement, much like interval training. No matter what unique method you choose to get fit, remember to keep track of the activity being done; using an app on a phone is a good way to do this. Apps can track distance, heart rate, calories burned and progress made. This can be a great motivator to get fit.